Overall nice hotel if you need a place to crash. Would definetly go there again. Large and clean rooms for 6 people. Clean and a very large room. Hotel lobby smelled kind of musty. Located off I6-64 in Bluegrass Industrial Park, the Comfort Suites in Louisville is ideal for business and leisure travelers as well as family vacationers. It is situated close to Papa John's Cardinal Stadium, the University of Louisville, and Sullivan College. Families will enjoy visiting the nearby Louisville Zoo and the Louisville Slugger Museum & Factory. For added excitement, don't forget the Kentucky Derby at Churchill Downs. The hotel is close to malls, movie theatres, restaurants, and cocktail lounges. Comfort Suites Louisville is a 100% smoke-free hotel, and is pet-friendly. Interior corridors with elevators lead to the 69 guest rooms which feature in-room air conditioning. The beds are extremely comfortable with down pillows and a duvet. Each guest room features Cable/Satellite TV, computer hook-up, free high-speed Internet, free local telephone calls, an in-room safe, iron/ironing board, microwave, refrigerator, multiple phone lines, and voice mail. Handicap accessible rooms and rooms with an in-bath whirlpool can be requested. Guests at Comfort Suites Louisville are treated to a complimentary deluxe Continental breakfast and a free morning newspaper. The hotel makes it easier for corporate guests to maintain their busy schedule by offering free high speed Internet access, free local calls, a Meeting Room, and use of a guest Fax machine. All guests welcome the chance to work out in the Exercise room or unwind and relax in the hot tub and indoor swimming pool. 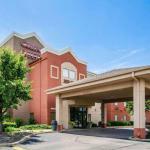 Comfort Suites in Louisville is recommended for its new, modern appearance and clean comfortable guest rooms. It is situated in a safe, upscale part of town--which is appreciated by many guests. Be on the lookout for it, though, because it can be a little hard to find--the sign is not readily visible from the street and is hidden beind a McDonalds. The swimming pool is well-kept--nice and clean. The hotel staff is friendly and helpful. Pets: Yes, pets are allowed. Check with front desk for details.